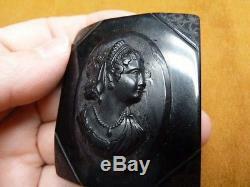 (Internal #C-1551) Excellent, black mourning cameo of a Woman with tiara (matching Bakelite cameo to setting), rectangular setting with loop etching in corners, 2-1/4 long x 1-7/8 wide, new clasp pin glued on reverse, chink out of back of setting under pin. Both settings and the cameo are VINTAGE, Circa 1920's. Settings are bakelite, cameo materials are as indicated. 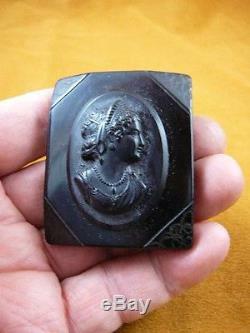 The item "(c1551) Woman in tiara black Bakelite mourning cameo pin jewelry brooch vintage" is in sale since Monday, December 23, 2013. 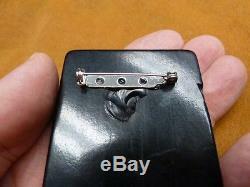 This item is in the category "Jewelry & Watches\Vintage & Antique Jewelry\Costume\Bakelite, Vintage Plastics\Cameos".